Attending the village fete, eleven-year-old Flavia de Luce pays a visit to the fortune-teller's tent. The Gypsy tells her that she can see a mountain and a woman who wants to come home. For Flavia, whose mother Harriet died in a climbing accident in Tibet when Flavia was less than a year old, this is a wounding disclosure, and in her shock Flavia topples the lamp doing some serious damage to the Gypsy's tent. Needing to learn more Flavia decided to pay the Gypsy a visit but finds that the old woman has been brutally attacked in her caravan. Flavia deduces that the Gypsy's fortune-telling has stirred up someone with guilty conscience; maybe memories of tragic events in the village's past? Flavia resolves to surreptitiously find out. But subsequently finding a body in the grounds of her home, Buckshaw, puts Flavia firmly in the spotlight of both Inspector Hewitt and her family. Undeterred Flavia uses her not inconsiderable skills of deduction to unmask the killer. Set in the 1950s in the village of Bishop's Lacey, this is the third adventure featuring Flavia de Luce, a precocious but interesting and at times enchanting heroine. Inhabiting the east wing of the somewhat dilapidated seat of the de Luce family, Flavia uses the scientific skills honed in her laboratory, formerly used by great-uncle Tarquin de Luce, to solve the mystery. As in previous books much of her time is spent avoiding her elder sisters Ophelia (Feely) and Daffy (Daphne) who she is convinced are trying to kill her. Indeed many of her experiments are dedicated to finding ways to poison, maim or frighten them. This is a delightful read with a refreshing protagonist - wonderful dialogue and marvellous characters. 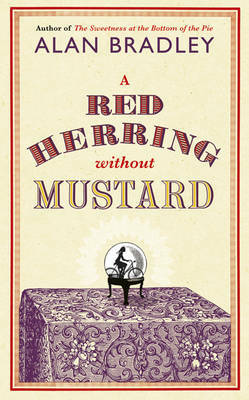 Cleverly written with aspects of humour that eleven-year-old Flavia is sure is passing over the heads of the adults, whilst much of theirs passes over hers.